Sometimes bats perceive a smooth, vertical surface as an open pathway, a dangerous error near buildings with glass facades, shown by injured or dead bats next to birds found underneath. The smooth surface reflects the echolocation calls away from the bat until shortly before collision and therefore acts like an acoustic mirror. Researchers of the Max Planck Institute for Ornithology in Seewiesen studied echolocation and flight behaviour of three bat species experimentally and in the wild. They observed them trying to fly through a smooth, vertical plate. However, bats seemingly also manage to avoid these collisions. Here, the number of echolocation calls and the time the animals spent in front of the surface influenced the probability of collision. Bats mostly rely on their echolocation calls for foraging, orientation and navigation. In our modern world, however, they encounter many sensory traps that lead to dangerous errors in interpreting their environment. 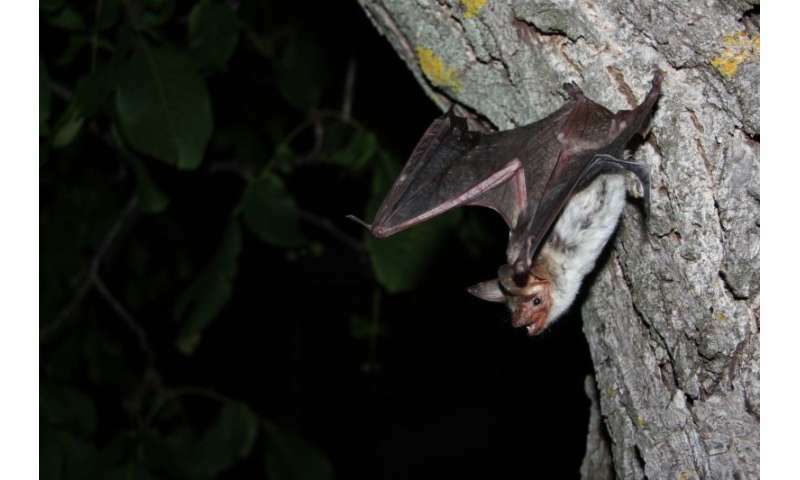 In a previous study, the researchers Stefan Greif and Björn Siemers of the Max Planck Institute for Ornithology in Seewiesen showed that smooth, horizontal surfaces are perceived as water by bats. The smooth surface is easy to recognize via echolocation calls as it acts like a mirror, reflecting calls away from the bat except for a strong perpendicular echo from below. In a natural landscape, lakes and rivers are the only spatially extended, smooth surfaces a bat might encounter. This information for water seems to be so hardwired that bats in the study did not give up trying to drink from a metal plate the researchers presented, despite several unsuccessful trials. Now, in a new study, Stefan Greif and Sándor Zsebők and colleagues of the institute have shown that smooth surfaces placed in a vertical position can be perceived as open flyways and not as obstacles when bats approach them. To this end, the researchers studied greater mouse-eared bats (Myotis myotis) in a flight room. They put a smooth, 1.2 x 2m metal plate against the wall, and with infrared-cameras and microphones, observed that 19 out of the 21 studied bats collided at least once with the plate within the first 15 minutes they spent in the room. None of the animals tried to drink from it. When the researchers placed the plate on the ground, however, they did not observe any collision but 13 animals tried to drink from the surface. In order to understand the sensory basis of the collisions with the vertical metal plate, the researchers analyzed the flight and echolocation behaviour of the bat in close proximity to it. They categorized the approach events into three situations: "near collision," in which bats approached closely but did not touch it, "collision with maneuver," in which bats collided despite clear evasive maneuvers at the last moment, and "collision without maneuver," in which bats collided without any noticeable evasive action. In only one-third of the observed approaches did the bats manage to avoid the collision with the plate. Initially, when flying towards the plate, all calls are reflected away from the bat at the smooth surface, giving bats the impression of a hole in the wall due to the lack of echoes. But once they get into close proximity to the plate, a strong, perpendicular echo appears and reflects back to the bat. Bats can use this echo to perceive that there actually is an obstacle and not an open flight path in front of them. In fact, the bats that collided produced fewer calls and spent less time in front of the metal plate compared to the approaches in which they managed to avoid the collision. So when bats had enough time and information to process the situation, they were able to recognize the perpendicular echoes and reveal the open flyway as an acoustic illusion. The researchers then conducted experiments in the field with three bat species and also observed several collisions with the panel. "If there are no echoes coming back to the bat except strong, perpendicular echoes from underneath, it is a clear sign of water for the bat," says Stefan Greif, first author of the two studies. "The exact same echoes coming from the side, however, signal an obstacle for the bat in the flyway that so far was perceived as open." The animals in this study could not fly fast in the flight room and therefore were not injured. However, along with millions of birds, dead and injured bats are found underneath glass fronts. The researchers suggest a systematic recording of such cases in order to better understand the actual impact on the animals and take measures on buildings with large glass facades at crucial sites such as "migratory highways," key foraging habitats, or bat colonies.